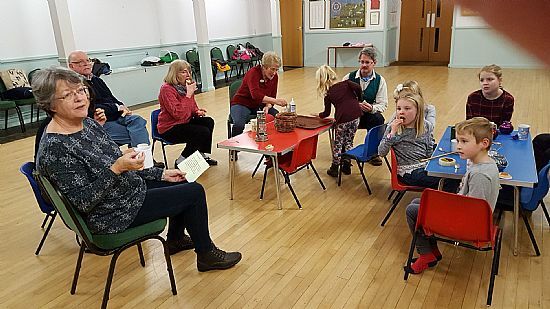 On Saturday February 11th, Paul held the first St Mary’s Fellowship Event of 2017. 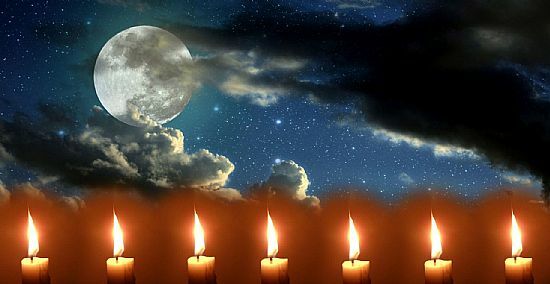 This one had the theme of Candles (making them and eventually lighting them) and Moonlight (it was a full moon) and the plan was to end up exploring the churchyard by moonlight and candlelight. 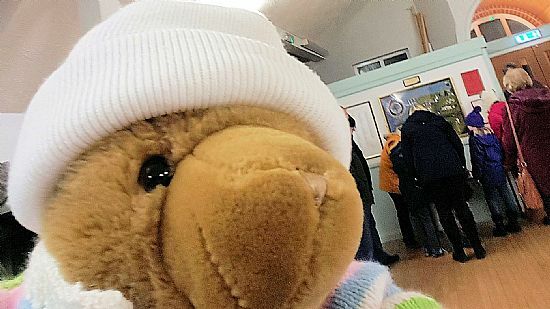 There follows an account of the evening’s activities; if you just want to see the photos, scroll down now. 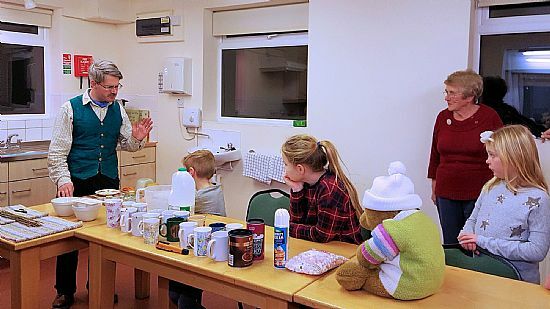 The event started at 6:30 in the Burnside Hall where a group of about twelve adults and five children turned out on a cold, miserable night. Attendance would probably have been higher but the event clashed with a concert being held in the Church at the same time, which some people were tempted to visit instead of joining us; they were lured there by the prospect of a seat in the warm, some sophisticated entertainment and a glass or two of wine afterwards. However the Fellowship event - which had been booked long before the concert - attracted a reasonable crowd too. 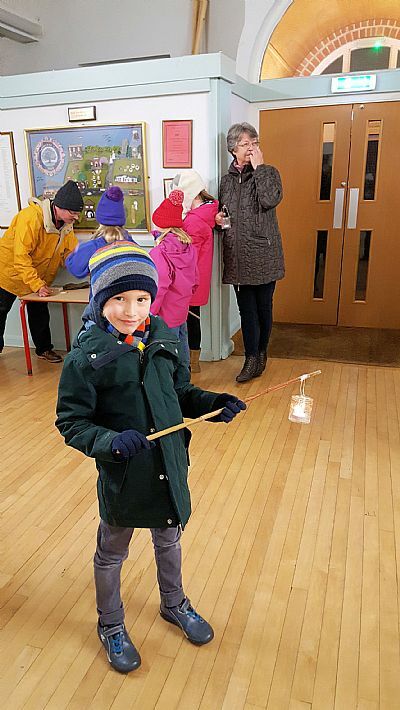 Our motivation was the prospect of making candles, drinking hot chocolate, tucking in to residual Christmas biscuits/marshmallows, and the opportunity to set fire to things (albeit in a controlled manner). 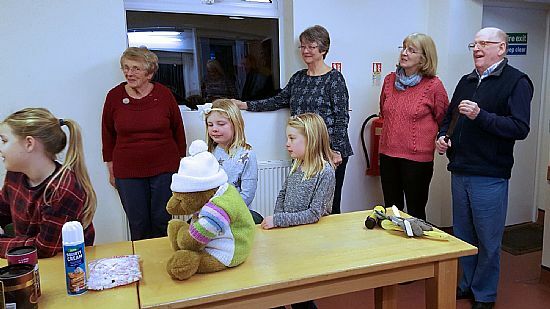 Also Big Ted, Roving Ambassador for St Mary’s, was present and observed the candle-making from a distance so as not to risk getting wax on his splendid fur. 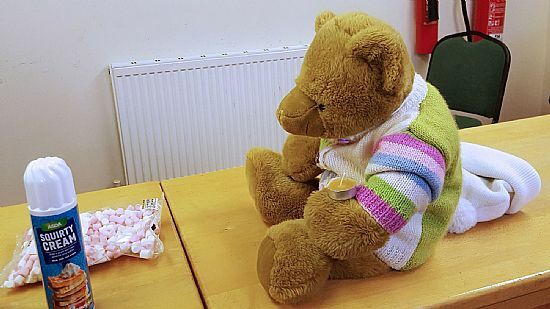 Big Ted’s report on the evening will appear in the April/May issue of the church magazine. When everyone had arrived, Paul led the group into the kitchen, where two cauldrons were simmering on the gas cooker, gently melting wax. 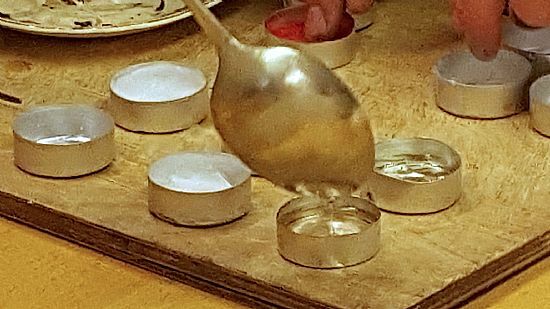 One pan contained ‘tallow’ (which is basically boiled down animal fat) and smelled like pork dripping; the other pan contained ‘beeswax’ (which is obtained from beehives) and smelled of honey. 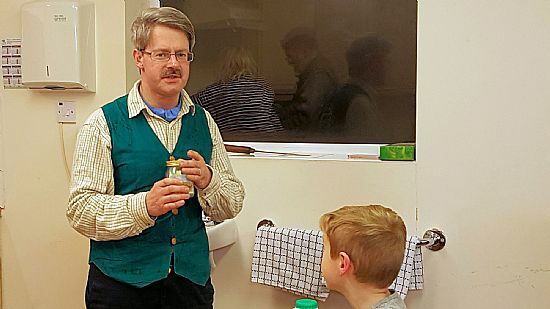 While Jackie and Walter were supervising the melting of the wax, Paul explored the theme of beekeeping by producing some bee-related ‘facts’ and asking us whether or not we thought they were true. Click here to see what this involved. 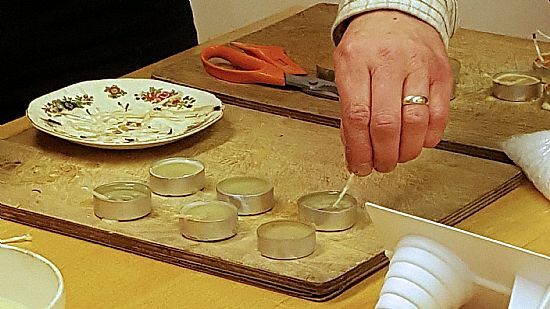 The group’s first task was to make some small candles called tea lights. 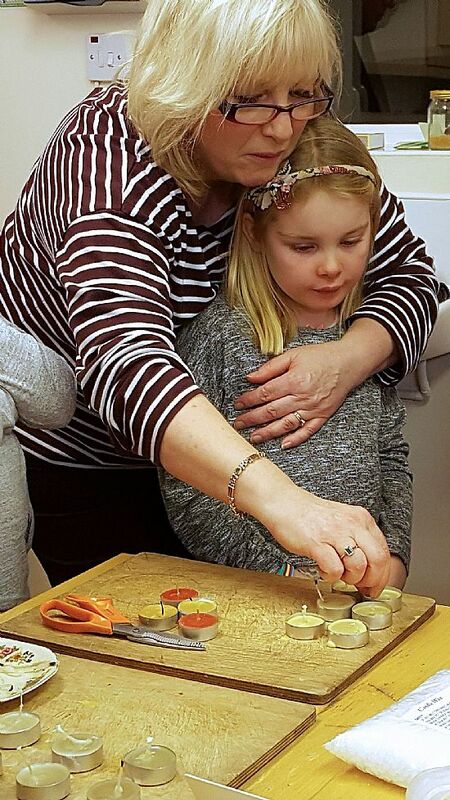 This operation was delegated to ‘responsible adults’ who carefully spooned the melted wax into moulds. That was the easy bit. Next it was the children’s turn, to insert short wicks into the wax and then hold them steady until the wax solidified. 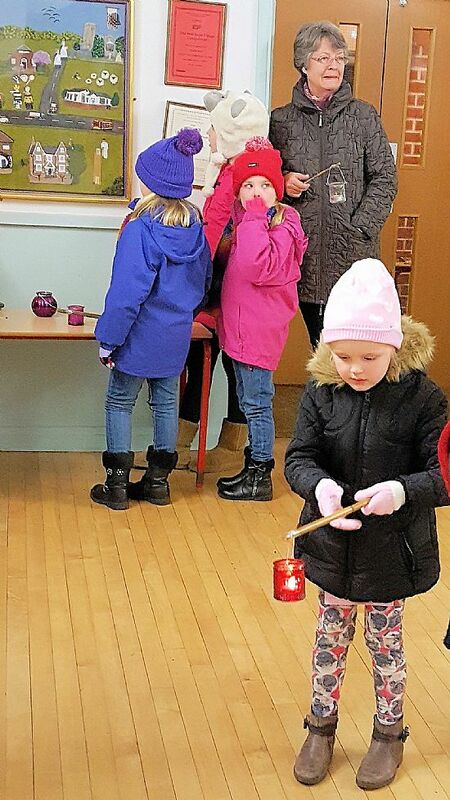 While the candles were cooling, we moved to the main part of the Hall where we all consumed hot chocolate, biscuits and cake. 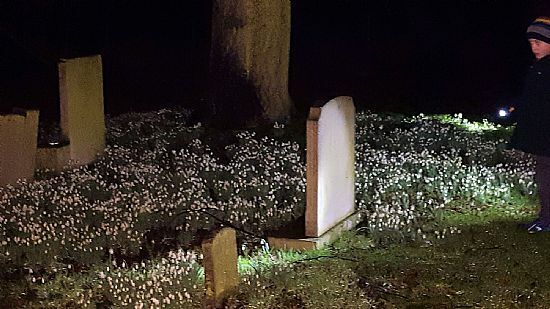 Paul then told us of a letter that Parson Burnside had written about there being hidden snowdrops and buried treasure in the churchyard, all guarded by angels. Then came the hands-on part of the evening. The children and some of the adults put their newly-made candles into makeshift lanterns. The candles were then lit (another ‘responsible adult’ activity) and we went outside into the cold night air. It was very dark and the sky was overcast so, sadly, there was no sign of the full moon. 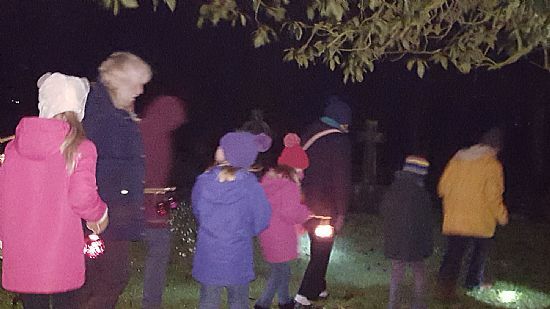 Undaunted, the party made its way over to the churchyard where we searched for the items mentioned in Parson Burnside’s letter, by the light of our home-made candles. We discovered the drift of snowdrops over by the Garden of Rest. Then we hunted for the angels. These were special angels known as ‘Belvoir Angels’ carved into slate headstones. They’re called this because such headstones are only found in and around the Vale of Belvoir; there are two of these headstones in Plumtree churchyard. Near to the second Belvoir Angel, Paul suggested that the children dig at a pile of stones in search of buried treasure. 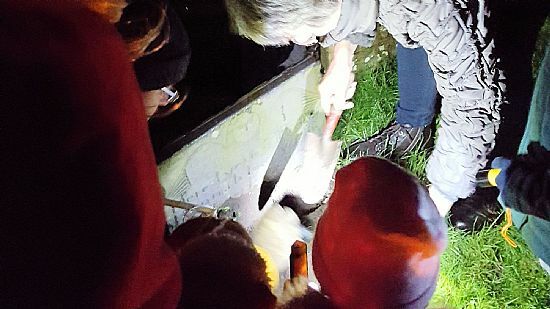 At this point we should mention that it’s not generally a good idea to go around digging up churchyards; in fact it may well be illegal. However this was a controlled excavation, limited to a few inches (or centimetres in children-speak). 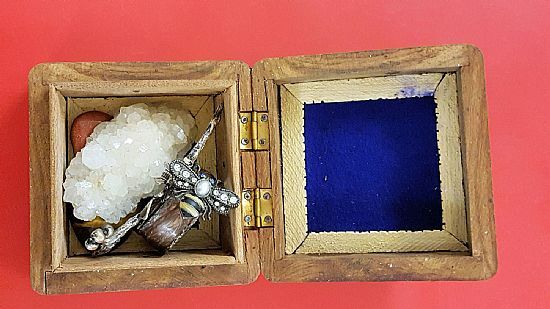 The quest revealed a wooden box containing some bee-related trinkets (and no bones or human remains whatsoever, let’s be clear about that). 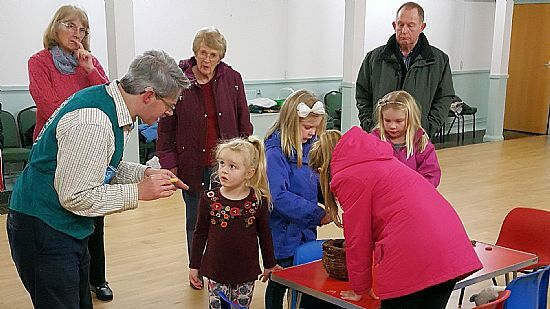 We returned to the Burnside Hall where the treasure was put on display. 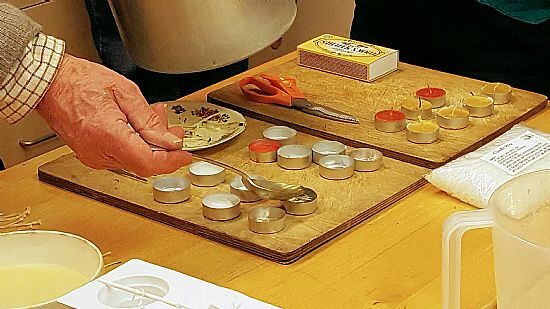 Everyone received a small gift of a professionally-made candle or a small jar of honey. 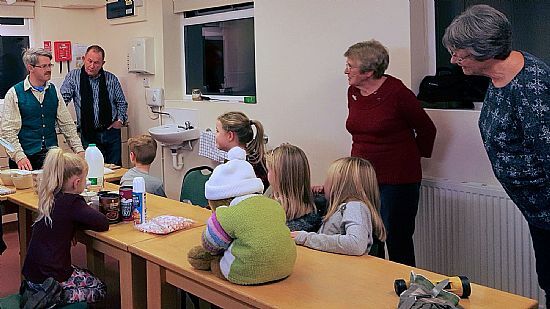 Many thanks to Paul for organising yet another educational, fun and entertaining evening. 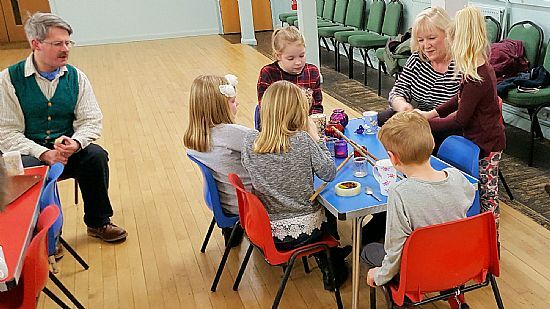 These fellowship events are designed to involve the church and the community in shared activities. Paul plans them meticulously and they combine moments of slick presentation with the occasional descent into the mildly chaotic. Long may they continue.